OzTAM impose a number of rules on us around how we use ratings data, that means the daily ratings post pretty much contains the limit of data we can share. So can we still give hints how poorly a particular show rates? Also, ratings numbers for shows outside the top 20 may be available one week later through consolidated ratings. Can they still be shared? As a non industry person here with little knowledge around rules and industry guidelines, why can’t there be discussion around non top 20? You can discuss, but just don’t mention the war, I mean, number. Why are the numbers so secretive? Are they not known industry internally wide? Because OzTam charges for the information and if people just share the data then they will lose their customers. OzTAM owns the copyright on all of the data they collect. They sell the information to interested parties, such as advertisers and marketing companies. They allow publication of some data by a range of media organisations under strict conditions. Media Spy has acquired written consent from OzTAM to publish the ratings results TVCynic posts each day. A lot of time and effort went into securing that deal and we won’t allow users to jeopardise our access to the numbers. Numbers for some programs outside the top 20 may be available via other sources but posting them here puts our deal in jeopardy. You may link to the source of such information, an online article for example, but the numbers cannot be posted here. The starting point is, as @NewsWeary posted, that OzTAM owns the copyright to all ratings data. About 7 years ago they undertook to share some of their copyright data in an organised and guaranteed way and set in writing the current conditions that allow the daily Media Spy posts. The main condition we are discussing here is that forum posts about specific program rating numbers are restricted to those available in OzTAM reports. Numerous recent posts have been in breach of this condition and the admin staff want members to be reminded of the OzTAM agreement. Has OZTam made a recent complaint about posts? 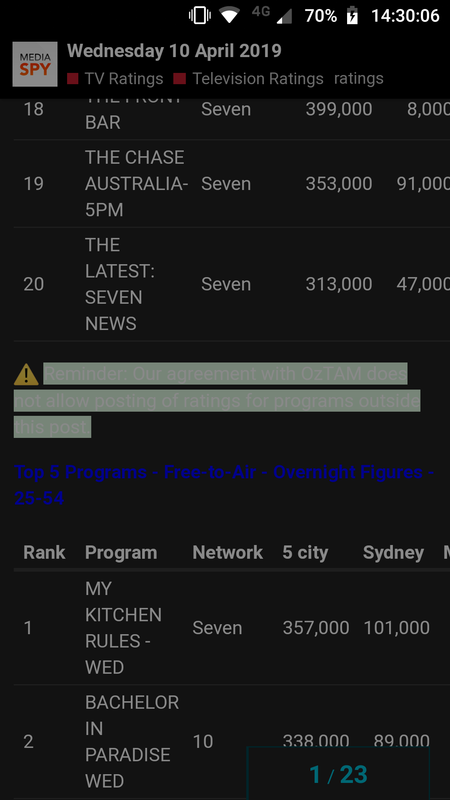 Are we allowed to say a shows ranking rather than a number? As in this example - interesting to see The Project rank 23rd last night. Rather than give a number. It might “hint on a number” but not directly give a number? Also, is this site no longer able to write up “Ratings Articles” that are able to talk about some shows outside the top 20? I used to read these articles some time ago. Or is that no longer the go? The warning doesn’t show up that well using Mediaspy dark mode with Opera night mode! This post contains a headline link that contains a ratings figure. Is this allowed under the rules? In short: members can always post a link to external articles - ratings or otherwise. On some rare occasions the article headline or forum generated spinet includes ratings numbers. That can’t be avoided and admin has determined that is OK. Thanks for clearing that up as I assumed it wasn’t allowed. What about links to Twitter posts that have numbers, as this forum displays the full Twitter post.